The Action® Xact® LP2 Contoured Wheelchair Cushion is the newest wheelchair cushion in the Action® line of cushions and pressure relieving products. The LP2 wheelchair cushion is an advancement in wheelchair cushions that incorporates the best features of previous cushions into a single product that will provide pressure relief, positioning and comfort in a cushion no more than 2" thick. 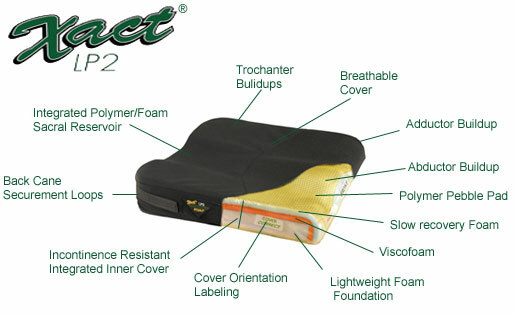 The Xact® Lp2 Wheelchair cushion is a multi=layered lightweight contoured wheelchair cushion that has a thin profile but also provides superior pressure relief and fairly aggressive contouring for excellent positioning control. The cover orientation labels visible through windows in the cover indicate if the cover is fitted properly and back cane securement loops have been sewn into the back corners of the cover to secure the cushion to the wheelchair. Action® Products Inc. have been in business since 1970 and produce a variety of products utilizing AKTON® Viscoelastic polymer. AKTON® Viscoelastic polymer was created by founder Dr. McElroy, during his pursuit to develop a pressure relieving material that would help prevent pressure sores in immobilized patients and is only available from Action® Products Inc.